Opening Times: 12.00noon - 6pm Wednesday to Sunday. Two contemporary artists Deborah Davies (aka Dd) and Hilary Champion, critique media manipulation and the hidden, vested interests which help shape public opinion in this pop-up art exhibition. 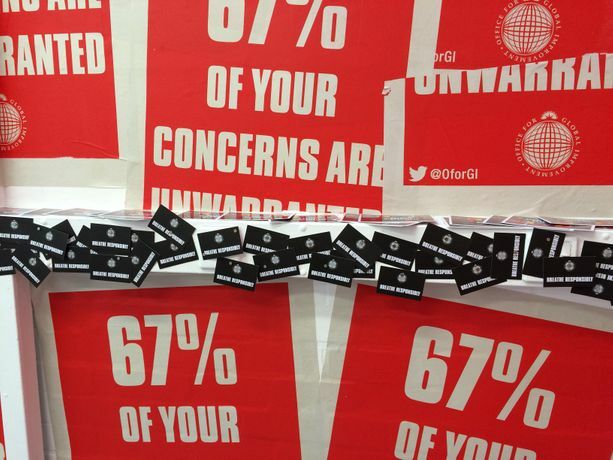 The fictitious ‘Office for Global Improvement’ shouts messages in an attempt to micro-manage you. 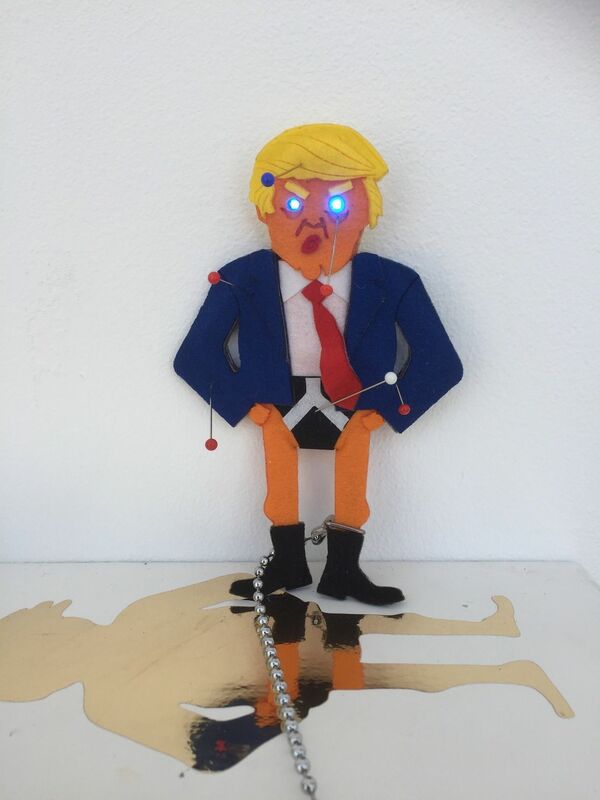 A small interactive effigy of the ‘orange one’ sits on a shelf with a set a pins with which to stab him, whilst another sculpture, taking its feed from Twitter comments on the suspected Russian interference in the US presidential elections. 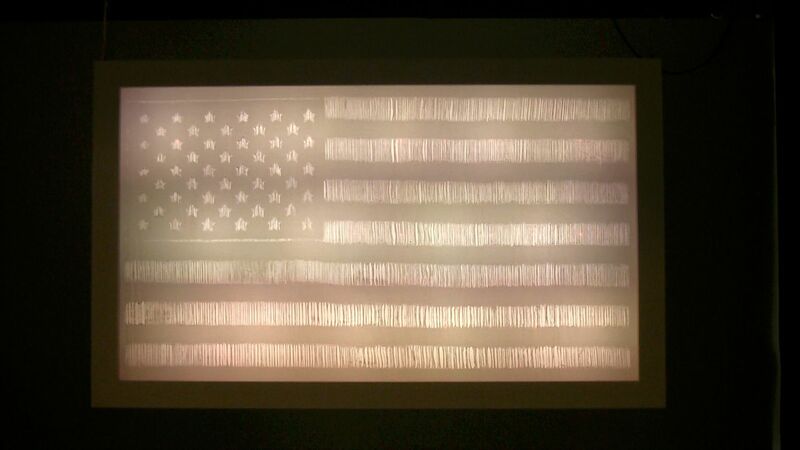 Deborah Davies’ (aka Dd) Faded Glory, for instance, is a technology-led piece that represents the ebb and flow of conversations on Twitter around Russia’s alleged interference in the 2016 USA Elections. Taking its feed from the live Twitter API the conversations are simplified to positive or negative statements: the more negative the conversations, the stronger the Russian flag shines through the distressed devoré fabric. Her interactive effigy of the ‘orange one’, entitled #DicktatorDon: ‘Making America Great Again….One Prick At A Time’ will also be on display with gallery-goers encouraged to add their comments and interaction to the piece. Hilary Champion's hand-made screen prints critique what the artist sees as the constant bombardment of the public by messages she believes are designed to raise the general levels of anxiety. Under the guise of her totally fictitious Office for Global Improvement the artist seizes, twists and exaggerates these messages to produce texts that are seemingly plausible yet which are, in reality, completely meaningless and ridiculous. She also invites attendees to join in the fun by displaying spurious messages of their own.